The content of this article provides interesting history, facts and information about Gladiator Training. It has been estimated that there were more than 100 Gladiator Schools (ludus pl. ludi) throughout the Roman Empire. New Gladiators were formed into troupes called 'Familia gladiatorium' which were under the overall control of a manager (lanista) who recruited, arranged for training and made the decisions of where and when the gladiators fought. When a new recruit (novicius) entered one of the gladiators schools to commence gladiator training he was assessed by the lanista, a doctor and the gladiator's trainers. He would be checked by a medici (a doctor, not to be confused with the doctores) for any medical problems and whether he was physically suitable to train as a gladiator and equipped to withstand the rigours of training and combat. The Gladiator's trainers who worked in the school were often retired gladiators who specialised in specific combat styles and weapons. The trainers were called Doctores. A Doctor who trained the types of gladiator called a Retiarius would be called Doctores Retiarii or one who trained Secutores, Doctores secutorum. Gladiator Training was not just about acquiring physical combat skills. Trained Gladiators were expected to behave in a certain way. They also had to be taught how to die. Their were specific death rituals in the arenas of the Roman Colosseum. Roman spectators expected gladiators to die bravely, showing no fear, offering themselves to cold blooded murder by their opponents. Gladiator training therefore included how to die gracefully and with honor. Wooden training sword for gladiators, not to be confused with the rudus given as a symbol of freedom. Gladiator Training commenced with getting the new gladiator to the peak of fitness. Their training did not initially involve using real weapons, as this would be dangerous for the trainers and staff of the schools. Wooden training swords called the the rudus were used (lusoria arma). A rudus was also given in the arena to a successful gladiator. In this context the rudis as given as a symbol of freedom. 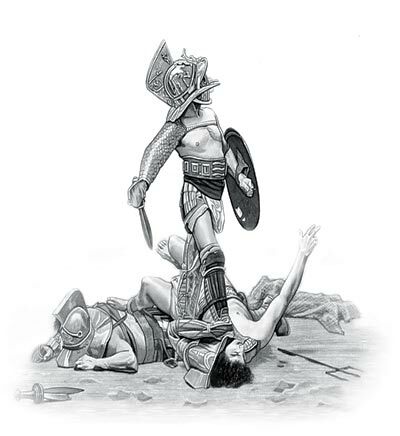 When new recruits entered the gladiator schools they were first referred to as novicius and when they had completed their initial training, and were ready to fight in the arena, they were called Tirones gladiatores or Tiro. Gladiator Training therefore reflected the armor and weapons used. Skill in using ancient Roman weapons was dependent on weapon practise. The weapons included swords, lances, tridents and nets and bows and arrows. Gladiator training was designed around fitness and acquiring skills with different types of weapons. A wooden pole called a palus was first used as a target to practise moves with a sword. The wooden swords used during training on the palus were often double the weight of the actual weapon ensuring that the gladiators would built up their upper body and arm strength. Palus training allowed a gladiator to practise various vicious strokes and manoeuvres such as thrusting, cutting, and slicing without imposing an injury on an opponent. Then other training equipment was used such as shield and dummy which were suspended from a swinging pole. When the shield was hit the whole apparatus would rotate. The gladiators's task was to avoid the rotating arms which sometimes had a heavy sandbag attached to them. Hilt and shield strikes were also practised. The content of this Gladiator Training category on life in Ancient Rome provides free educational details, facts and information for reference and research for schools, colleges and homework. Refer to the Colosseum Sitemap for a comprehensive search on interesting different categories containing the history, facts and information about Ancient Rome. Just like the subject of Gladiator Training there is hardly a page of Roman history and the Romans that is not, on some way, connected to the Roman Colosseum which became a symbol of Rome, its society, culture and life.